The giveaway has ended and I'll be announcing the winner shortly. Stay tuned! Meanwhile, on Tuesday we celebrated LO's birthday and took her to get fries for dinner. I noticed that it's one of her favorite foods, so of course I had to spoil her with a plate. We went to The Counter for burgers, and ordered her her own plate of two mini veggie burgers with a side of fries. She nearly devoured all the fries herself along with a veggie patty. She had a ball! If she had a belt, I swear she would have loosened it a notch. I recently got my hands on Illamaasqua Pink Raindrops and I was totally excited to swatch it despite the poor reviews I read about the formula. The formula lived up to the hype(or un-hype perhaps), and was not easy to apply smoothly. It was thick and patchy and didn't self level at all. I used three coats for the mani below with no topcoat. Regardless, I love every single pink iridescent flake in the mani. The pale pearlescent pink color, not so much. The pale shade doesn't do much for my skin tone. 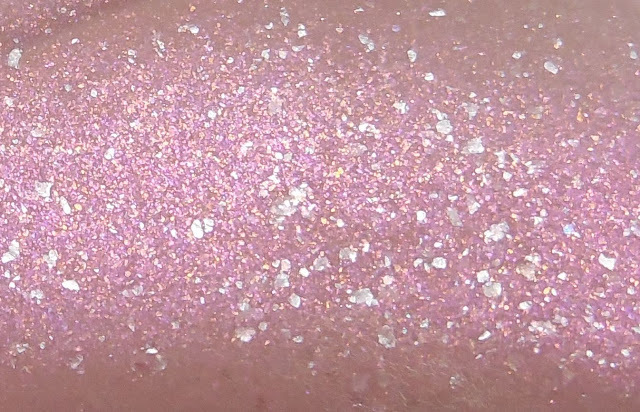 It's a shame that it doesn't transfer over onto the nails, otherwise this would be an incredibly stunning nail polish. This is the first time that I've been disappointed by Illamasqua but it won't deter me from purchasing other nails colors from the line. Illamasqua has always provided me with perfectly performing polishes(say that three times fast) and I'll continue using their brand. I love it!!! LOL... you've got my taste spot on! No likey the pinky, pass me some yummy squishy red!